My 24 month contract with EE (originally Orange) was coming to an end so I called them up to tell them I didn’t wish to renew after the contract end date. 20 minutes of hard-selling later by two different people, I finally managed to convince them that I wasn’t going to change my mind. It’s not that I’ve been unhappy with EE’s service, just that they didn’t have a deal that I wanted to upgrade to and I knew I could probably find something from somewhere else and save some money at the same time. The thing is, for my sins, I’m a dedicated Blackberry user; such devices are so old fashioned and unpopular these days, that EE didn’t have any as available upgrades on their website. I just happen to like using the little keyboard, plus I like being different from my friends who are all iPhone users. I was paying £22 a month which was the best deal I could find at the time. For the past 6 months, I’ve also been using billmonitor.com which analyses my mobile phone usage, so I know what I actually use my phone for in terms of calls, texts and data usage. The most useful bit of the analysis showed that I rarely go over 400MB data usage a month (average 300MB), so I know that I don’t need to pay for a large data allowance to be included. As with when I renew my insurance policies, I shopped around for the deal I wanted and in the end, I went for a deal with Mobilephonesdirect.co.uk. 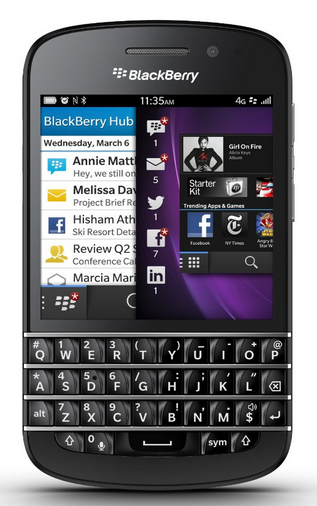 It’s another Blackberry (the Q10) and the network I’ll be using will be…..EE! Yes, really! Seems they weren’t offering such deals direct but do so via third parties. I’m now paying what works out as £17 per month on a 24 month contract (£48 for the handset, £15 monthly rental), with similar provisions to what I had in my previous contract with EE, only now on a 4G network. I also received £31.50 cashback from TopCashback*. Did I really need a new handset? Could I have gotten a cheaper deal? Yes, if I’d gone for a sim only/pay as you go deal and continued to use my old handset. 3) I’ve treated myself to something new which doesn’t happen very often these days and at no extra cost, so I see it as win, win, win! I should be able to get something for my old handset too – may as well get that recycled for a bit of cash. This entry was posted in Cashback, Expenses by weenie. Bookmark the permalink. I am still using my trusty iPhone 4 and pay about £13 per month on a pay monthly contract. I've found that the new models don't really offer any benefit for the [significant] extra cost and hassle of being tied in to a contract. Before I got a company phone I used to call Telus on a regular basis and ask for discount on my cell phone bill. It took a few tries but I managed to get a pretty good plan and only had to pay $25 taxes included. Way to take charge on your cell bill. I'm an Android man when it comes to phones, the iPhone stopped innovating years ago, as UTMT has pointed out above. Android are now better technology, easier to use, and darn well cheaper to boot. I haven't persuaded Mrs TFS to switch yet though but managed to buy a refurb'ed iPhone 4S 16GB on ebay the other day for £90 which I thought seemed like a bit of a steal, I am hoping to sell her 8GB model with a cracked screen for not much less, 3 days to go on the auction so we'll see how that pans out! When her contract is up we'll look into SIM only contracts. I have a work phone at the moment so it's "free" which is one benefit I will lose and have to pay for once I quit the day job, but I think I can hack that when it comes down to it! Congratulations on the saving and for using Topcashback. As I was reading it, and I could tell that the purchase was in the past not the pipeline, I was wondering if you used them. They usually provide great payments for phones. I'm extremely old school with phones. I have the Galaxy S2, which is VERY old now. I buy sim only deals each year, keep within my usage easily, and benefit from cashback each year. My monthly bill for the smart is just over £8 a month, and I'll continue using it until it dies. I'll probably then source a Galaxy S2 or 3 again at that point on Ebay and go Sim only again. I'm with UTMT on phone upgrades. I have been shown the benefit or differences to the new phones, and they are amazing. For me though, the idea of having the internet alone on my phone is still the main factor. I don''t need much more than that. I personally can't justify the extra initial outlay or the increase in monthly spending to upgrade. Congrats once again for bringing the cost of your payments down and for pocketing a bit of cash on the way! Win-Win all around! Hi UTMT, Good to hear that you have a trusty old handset so have no need to upgrade. Unfortunately, my old Blackberry was no longer trusty and was getting a little temperamental (randomly turning itself on and off). Although I could have probably lived with this, it was starting to get frustrating. Hi Tawcan, yes, it's possible to contact the network supplier to see if you can get a discount or better offer. My boss did this and was able to get a good deal but it was only worth it because it happened to be for the phone that he wanted. Hi TFS, lol, a lot of people ask me why I'm still with Blackberry but I can't help myself! I do reckon that if I eventually move from them, I will go for Android rather than iPhone. Good ebay bargain on that iPhone and good luck on the sale of Mrs TFS' phone. Hi Huw, wow £8 a month is excellent! I'm hoping that my new phone will still be good after the 24 month contract so I can then switch to a sim only deal. I know a few people who always have the latest iPhones or Android phones and I never understand why, when they all pretty much seem to be the same and do the same thing, although perhaps a nano-second quicker or the screen may be x% sharper – who can tell? For some reason, they're also the types who end up getting their phones stolen – I guess one good thing about owning a Blackberry is that nobody is likely to steal it lol! Thanks for the congrats and yes, I can't wait to get the TopCashBack funds in my account so I can invest it! Good work on cutting back on your phone costs. I'm the same, did I need a new phone? Probably not, but I use it for everything, and £28 a month wasn't too bad. Calendar, camera, internet and now writing blog posts. So it's good to have one that runs quick. And I used my last phone (iPhone 4) for about 4 and a half years. Hi Mr Z, no worries – it's good to see more and more UK based blogs! Yes with phone costs, if you actually use what you are paying for, then you're on the right deal – why pay for unlimited data allowance if you hardly use the internet etc. Anyway, I hope I'll be using my phone for many years too. Kudos for sticking with a phone that works for you, knowing what suits your needs and not being taken in by the promises of new improved shiny-ness. I know plenty of people that use Blackberry's because they do what they require from a phone. Sorted. I've got plenty of friends using i-things too, and while I'm sure Apple make perfectly good products, there are a lot of better products out there at half the price and will most likely be much better suited to what someone needs, rather than what they think they need. Each to their own but I'm not a planned obsolescence fan. i-rant over! Meanwhile I'm on a £30 a month contract which is way over the top for what I'm using, so I'll get a work mobile in the Summer and get the cost down to a very reasonable £0. Hi Starla, thanks! When I look at my friends' phones, I admit there's loads of stuff they can do that I can't do on my BB, but it's all 'nice to have' stuff – I ready have all the apps etc that I need. Great news on the switch to a work phone thus saving you £30 a month!